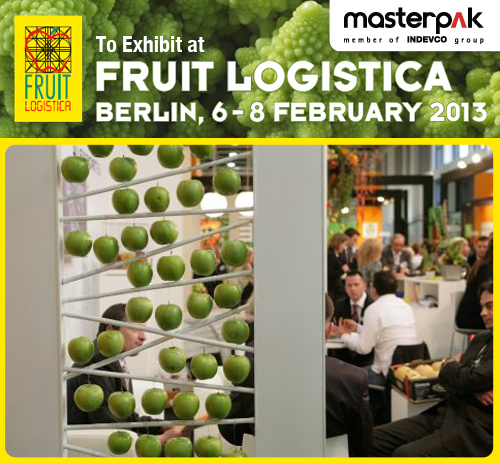 Masterpak, Lebanese polyethylene (PE) film manufacturer, will meet with global business leaders in the agricultural and horticultural sector at FRUIT LOGISTICA 2013. Masterpak, member of INDEVCO Flexible Packaging division, will showcase agricultural and horticultural PE films at FRUIT LOGISTICA 2013, the world's leading trade fair for fresh produce, from 6 – 8 February 2013, at stand # B-13, Hall 8.2 at Messe Berlin, in Berlin, Germany. From the company’s wide array of polyethylene films, Masterpak will display greenhouse covers and soil disinfection films, as well as silage covers at FRUIT LOGISTICA 2013. Masterpak representatives will gain a complete overview of the latest trends in the fresh produce industry, and meet with new prospects from around the world interested in fresh fruit and vegetable sector. FRUIT LOGISTICA, the leading international meeting place of the fresh produce trade, brings together more than 2,400 companies from across the entire fresh produce value chain. The exhibition offers a platform for worldwide small and medium-sized suppliers and players the opportunity to initiate business deals and contacts.